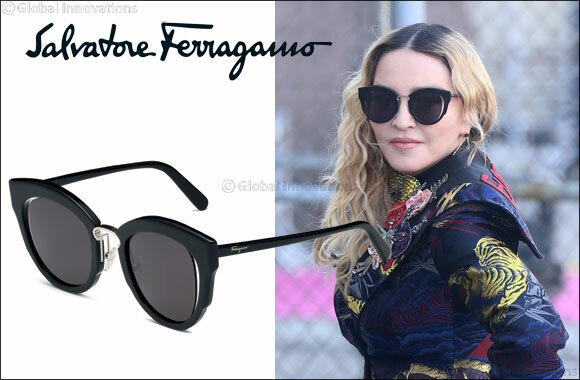 Madonna wears Salvatore Ferragamo eyewear. Dubai, UAE, January 17, 2017: Madonna wearing a pair of black cat-eye Salvatore Ferragamo sunglasses at 'Billboard Women In Music', New York. This cat-eye silhouette features sharp-cut lenses and a unique color palette. The combination of different acetate elements creates a color blocked effect inspired by the fashion world. The dynamic design is enhanced by the special structure of the metal bridge. Available in Black, Dark Havana/Green, Light Havana/Red and Blue/Ivory.